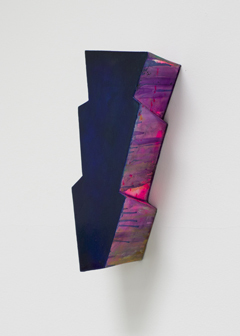 Galerie m is presenting from 29 June to 24 November 2018 selected works by Elisabeth Vary (*1940) in an exhibition titled “vis-à-vis.” The Cologne-based artist creates three-dimensional, asymmetrical, and usually angularly shaped forms that cannot be classified under the conventional geometric categories but are instead idiosyncratic formal inventions. 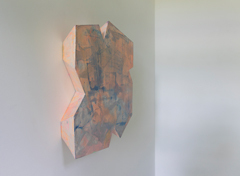 These shapes then enter into a dialogue with their all-over painted surfaces. Vary’s works beg to be explored slowly and thoughtfully, with sensitivity and intuition. They harbor numerous oppositions that only reveal themselves gradually. The coexistence, or juxtaposition, of painting and form, surface and volume, light and dark, monochrome and colorful, shiny and matte are what give these works their unique appeal. With continuing contemplation, the viewer must continually revise his or her initial impressions as new perspectives unfold. Access to Vary’s works is thus at once instantaneous and gradual, subject to a process of ever-finer differentiations. Seeing itself becomes a continuum.